Almost daily I come to problems I’ve seen before. Usually I have solved them successfully, but I struggle to remember the correct and effective solution when I need it again. I have also created lots of gadgets and devices, which usually after some time end up stacked in a box. And no one, even myself, think of them again. I think it’s a pity. This is why I decided to start this blog, called “mind.dump()” – to make a dump of my mind, thoughts, ideas and experiences. To archive them, make them searchable and also to share them. I profit a lot from others’ experiences, they shared, in my work, so I think it’s right to do the same and possibly to help others. 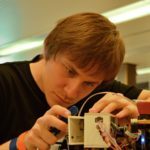 Expect posts about programming, electronic, computer science, robotics, CNC machining and others.